The team members at Health Choice One make it their mission to connect individuals with comprehensive, affordable health insurance. The specialists broker a wide array of plans and packages from multiple different carriers until they find the perfect fit for each customer. Last year, Cassel Bear had the privilege of designing a mailer for Health Choice One that reminded their clients of the Open Enrollment period and that it was time to either renew their current or seek out a new plan. As we approach that period again this year, Health Choice came to us with a similar request – with a twist. Since a health insurance mailer is likely not the most exciting piece that someone finds in a mailbox, Health Choice One gave us permission to have a bit of fun this year – to create something that would not only be memorable on this mailer, but a character that could appear across some of their other marketing pieces as well – door tags, direct mail postcards, brochures, and more. Since Flo is already busy appearing in ads for Progressive, the Cassel Bear team got to brainstorm some new concepts. Remember Highlights magazine? Remember the section called “Goofus and Gallant”? 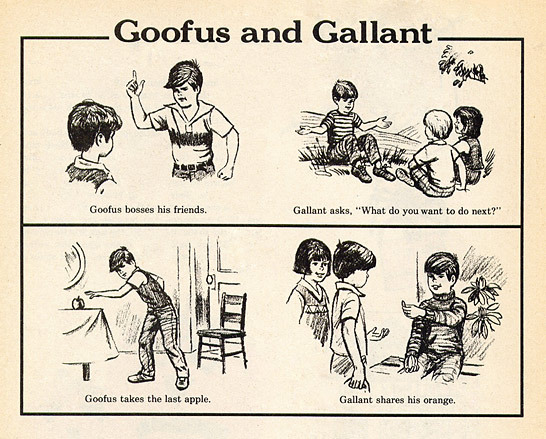 Each issue, children were given a compare-and-contrast lesson, reminded to behave the way that Gallant would and avoid being a Goofus. Our team thought it might be fun to riff on this, highlighting the ease of the insurance process if clients choose to work with Health Choice One versus the complications that would ensue if they tried to figure out the insurance morass on their own. To that end, we created some suped-up stick figures that can be put in a variety of clothes or contexts to tell opposing stories. If this concept is selected, our Gallant stick figure might be the picture of health, while out Goofus figure could find his arm in a sling, head bandaged, etc. Today’s culture, thanks to texting and online chatting, talks in emojis. What better way to communicate than through a semi-ironic usage of them? Health Choice One gave us a list of possible scenarios that people might find themselves in, and we began to illustrate emojis for them. As a few examples: What happens when your carrier leaves the market? What happens when you find out your pre-existing condition isn’t covered? What happens when you get sticker shock from your new rate? Animals are all the rage these days. Think of how many companies you know that have some kind of talking animal as their mascot in commercials and on billboards. But since the Geico gecko is already taken, we had to come up with another route. In talking about Health Choice One’s posture toward the clients, the two things we kept coming back to were the multiplicity of options and the way that clients are taken care of and nurtured. This led to experimentation with an octopus (whose eight arms could be used to diagram out different choice and options clients have) and a kangaroo, who cuddles its baby in a pouch. We were also inspired here by the work of the great Charley Harper (www.charleyharper.com). Taking the animal idea a little further, we started talking about birds and how many birds are associated with stages of life / life rituals that insurance covers. For example, the stork comes around at the occasion of a new birth. Dodos remind us of extinction and death. Lovebirds signify marriage. And on and on and on. Another train of thought led us to start creating illustrations of different birds that could be utilized to help people think through coverage for major events of life. We also liked the idea that the birds could be used individually or in a flock to talk about personal and group policies. So, in the end, what did the folks at Health Choice One decide to use from this brainstorm session? Find out soon!